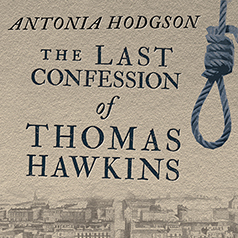 In this Georgian–era mystery by Antonia Hodgson, Tom Hawkins prays for a royal pardon as he relives the espionage, underground dealings, and murder accusations that sent him to the gallows. London, 1728. Tom Hawkins is headed to the gallows, accused of murder. Gentlemen don't hang, and Tom's damned if he'll be the first. He may not be much of a gentleman, but he is innocent. He just always finds his way into a spot of bad luck. It's hard to say when Tom's troubles began. He was happily living in sin with his beloved, Kitty Sparks, though their neighbors were certainly less pleased about that. He probably shouldn't have told London's most cunning criminal mastermind that he was "bored and looking for adventure." Nor should he have offered to help the king's mistress in her desperate struggles with a brutal and vindictive husband. And he definitely shouldn't have trusted the calculating Queen Caroline. She's promised him a royal pardon if he holds his tongue, but then again, there is nothing more silent than a hanged man. Now Tom must scramble to save his life and protect those he loves. But as the noose tightens, his time is running out.